Tasting note: An exceptionally fresh and already expressive nose of pure essence of red berry fruit, earth and hint of underbrush leads to attractively energetic and well-detailed flavors that possess a textured mouth feel before terminating in a balanced, saline, clean and ever-so-mildly austere finish. This is a very fine example of the appellation that could be enjoyed now or held for a few years if desired. Good stuff and worth your attention, particularly for value. 介紹/說明 Frédéric Magnien為新一代釀酒師中的佼佼者. 接手後經常釀出高分佳作, 自己並成立酒商Maison Frédéric Magnien,購買葡萄釀製更多不同莊園的葡萄酒. 1988年 Michel Magnien 以佃農身分接管父親的葡萄園並持續將其父親 Bernard Magnien的年收成供給給 Morey -Saint- Denis 的合作社. 直至1993年, Frédéric Magnien加入家族事業, 說服父親 Michel 應裝瓶所有自己的收成. 自製自銷. 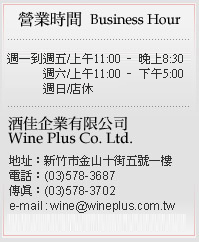 Wine Avocate 酒評家者之一, Pierre-Antoine Rovani稱其為值得敬佩的酒莊. 經過兩年沒有收入的艱苦情況下, 1999年酒莊再度釀出卓越的葡萄酒. Domaine Michel Magnien & Fils (Michel Magnien與其子酒莊)現今已擁有19公頃包括特級,一級,村莊級,及區域法定產區葡萄莊園的酒莊. 其葡萄酒品質忠實地反映出MichelMagnien 以自然動力法(Michel當初只是希望他種的葡萄可以直接吃) 悉心照料他的葡萄園的結果.現在釀酒及酒莊經營已完全交予兒子Frédéric Magnien, Michel則繼續管葡萄園. Frédéric Magnien為新一代釀酒師中的佼佼者. 接手後經常釀出高分佳作, 自己並成立酒商Maison Frédéric Magnien,購買葡萄釀製更多不同莊園的葡萄酒. Tasting note: Light reduction knocks down the nose but the underlying fruit seems to be ripe. There is good punch and detail to the delicious flavors that culminate in a mildly rustic and persistent finish. 地塊: Côtes de Nuits 及其他村莊級所降級的葡萄, 故品質極高. Tasting note: There is a lovely sense of purity to the elegant and solidly complex aromas of red berry fruit and earth nuances. In the same vein there is good purity to the precise and well-detailed middle weight flavors that offers good energy and balance on the moderately structured finish. This should be approachable young but age too if desired.